This sign cracked me up when we went to park at the conference I attended in Atlanta this past weekend. 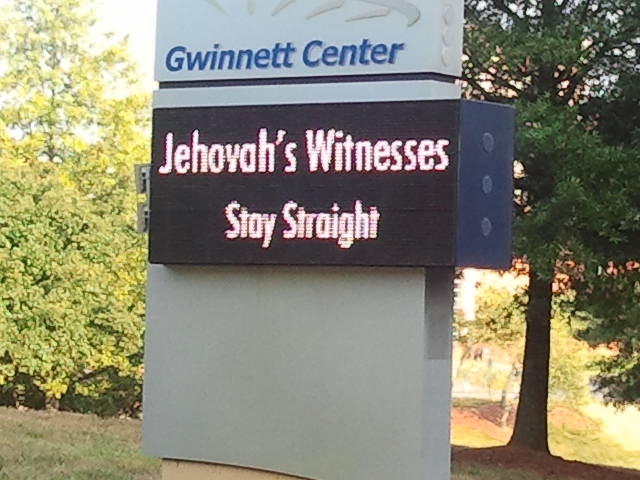 I was not at the Jehovah’s Witness meeting, but they were in the same facility as our meetings. « Stress- I HAS it! Cute sign. And sorry about your mom. Thanks Shay. On both accounts. I’m worried about mom. I’m afraid she’s never going to be the same. The sign is directional. They were to drive straight to the far parking lot and we (our convention) were to turn right into closest parking lot. It made me giggle so I had to stop and grab the shot. Lol. I’m wondering if they even caught it. You’d think someone would comment to them. Na. I bet they didn’t catch it. Probably some dense bureaucrat put it on there. Lol.